Alpina is a storied automotive manufacturer with rich history attached to its name. We had the opportunity to sit down with Alpina’s sales director, Kris Odwarka while in New York to talk about the company’s history, current lineup, future, and technology. Mr. Odwarka proved himself to be very approachable, personable and enthusiastic while speaking with us about the company he works for. We’re convinced you will find the following interview extremely interesting. Get some coffee brewing and put your feet up, the following is a transcript of BMWBLOG’s exclusive interview with Mr. Odwarka. Kris, it’s a pleasure to interview you. There is a certain mystique and aura about Alpina that is very prevalent with the band. Can you explain a little bit about the magic and the specialness of the brand? Yes, I think the mystique and aura of any brand – especially a brand that has stood the test of time, whether it’s in the automotive business or any other – is generally rooted in fundamentally correct values in terms of the brand. Our engineering prowess for a brand as small as we are and over such a long period of time, our victories in racing in the 70s into the 80s, coming back after 20 years of not racing to enter the FIA GT3 class last year and doing exceptionally well in the second half of the season. A lot of the engineering contracts that we’ve had with BMW together, where BMW were able to test in a small volume setting something that they then put into large volume production later. All of these accomplishments create mystique and aura. You’re familiar with some of our patents, we’ve talked about that: over 200 patents in our history. The first cross-drilled rotors, the first electrically preheated catalytic converter, the first electronically controlled catalytic converter, the first precious metal catalytic converter, all done with our suppliers together – these accomplishments are a hallmark of who we are and what we are about, and that’s over decades. 1964 was when we started dove-tailing the warranty that was on offer from BMW to us. We didn’t ask for it, they offered which is wonderful, so that afforded us this unique position with BMW that remains the same today, so 46 years later we find ourselves in the same position. The mystique and aura, is a wonderful question but it’s really in our case founded in great technological prowess, witnessed in the patents, witnessed in our success in 2 car and 3 car tests by third parties such as yourselves and in our racing history. You know we can’t buy marketing, we wouldn’t want to, that’s not who we are. I think the integrity of Alpina remains whole by virtue of the real word of mouth, the exclusive cachet and the very small numbers. The B7 is a wonderful example, it’s an excellent vehicle, extremely complex to build and by virtue of that we can only build – with great help from BMW one must say – worldwide 4 cars per business day. Over all iterations of B7, short wheel base, long wheel base, all wheel drive, rear wheel drive – if you broke those up evenly that would be one per day for the world of each of those four iterations, so you won’t see yourself driving down the road anytime soon in [a copy of] your car. So there’s certainly cachet, aura and mystic in terms of the small numbers, but I think a lot of it is also ‘the little engine that could,’ or the concept that we’re the bumblebee that shouldn’t be able to fly but breaks all the rules of physics and still does. A lot of people pull for the under dog so we’re lucky that way, very lucky. Could we go over the history of Alpina? The brand was initiated in which year? Mr. Burkard Bovensiepen blew up his Fiat in 1960, which led him to prefer BMW to this day. In 1961 he bought a BMW 1500, BMW came out with the 1800 and his 1500 couldn’t keep up anymore. That was the precursor to the 5 series. He developed a dual down draft Weber carburetor kit so that his 1500 could keep up and that was the genesis. By virtue of being this interesting human being who was focused on both business studies and engineering studies at the same time – which was a rare thing in the late 50’s – he created a quality mindset and an engineering and technical mindset at Alpina that led to 1964, the dovetailing of the warranty as we talked about, offered by BMW – that’s a unique relationship to this day. We’re the only outside source and I don’t know of any other similar situation in the world for any other small external bespoke manufacturing company. In 1978 we changed our business model from being a tuner, making parts and sometimes complete cars based on those part sales to focusing on complete new vehicles. 1983 the Germany ministry of transport and the British ministry of transport came to us and said, you need to be the manufacturer of record because more is added by Alpina than BMW. In terms of engineering and development, you need to be on the hook for legal liability, parts, warranty, parts logistics, all of that – Since we were already performing all of these duties, and carrying this responsibility, anyway, we readily accepted. Fast forward again and 2003 was the year where we, like anyone in the luxury automotive segment, we came to the United States, as anyone must. More than half your sales above a certain dollar MSRP or MRRP price point will occur in North America. Canadian sales are not to be forgotten. The Canadian market is a heavily over represented market, it’s quite the wealthy country indeed. And that is why xDrive was so important to us . That shift in 2003 was really the jumping off point in growing the company. Early 1980’s to late 1990’s we sold about 500 cars a year world wide across all our iterations, 3, 5, 6 and 7 series based cars. That then rose to a watermark high of 1,500 plus sales in 2007 with the advent of the model year 2007, 2008 B7 for North America. Across all of our cars and all of our markets and we should be breaking the number quite readily in the years to come, even in a difficult economy. I think this is because, tying it all together with what you were saying, we are the bumble bee that can fly – we’ve got this mystique, this aura, this exclusivity driven by our low numbers but also very much driven by this quality mindset and reliability. Our big, big point is that the car should be very reasonable in repair costs; it should be excellent in fuel economy. We were all about fuel economy and we talked about the patents being emissions driven, well before it was cool to talk about emissions and well before that was cool in our segment. Mr. Bovensiepen was all about emissions and fuel economy in the early 70’s, late 70’s – he’s the one that forced the German touring car championship to be the first touring car championship in the world to run catalytic converters because the year before he had won the German touring car championship with catalytic converters installed on his race cars. When we where hosting BMW at our facility in their early phase development of their Formula 1 engine – that 4 cylinder Formula 1 engine that won the world championship in 1983 – that early phase development was done at Alpina and at the same time in 1981 we won the Shell fuel challenge marathon. Open to all factories we won it on the Nurburgring – minimum speed of 50 km/h (31 mph) and beat all the factory teams in imperial gallons, a little over 105 mpg. So you talk about mystique, you talk about aura – for us performance is not just about naught to sixty, it’s what we call “And Engineering,” very much a hallmark of our company. It’s easy to go fast; can you be fast and reliable? Can you be fast and smooth? Can you be fast and low-cost maintenance? How can you combine excellent cornering ability and a supple ride? You’ve read many reviews of Alpina cars – that’s what strikes people most. How can these massive 21” wheels and tires ride this smooth? One of the things we patented when we developed the BMW 3.0 CSL – “The Batmobile,” that was an Alpina development for BMW – in the old slide rule engineering days we found that a 20 spoke wheel is the optimum for the best compromise between weight and strength in a wheel. And so, we patented that and we’ve stuck with our 20 spoke wheel design to this day. That’s the genesis of it; we named it a classic wheel only in 2003 because we had the dynamic wheel then for the roadster V8. Again, that aura, that mystique, that exclusivity all come together in engineering, reliability, what we call “And Engineering” and being able to achieve something that’s unique on the road and not normally to be expected of someone with our small volume. The last thing that needs to be said about that is that it would be impossible to accomplish this without this unique and strange cooperation of a completely independently owned, family run corporation with 221 people and a major and probably the best saloon and volume car maker in the world. It is unique, it’s why we’re successful and that, I think, in those pieces all put together, that’s where the aura and mystique and exclusivity all come together. What does Alpina offer in its current lineup of cars? World wide we offer two versions of the 3 series. We have a four cylinder 2.0 liter diesel that’s sold predominantly in Europe and in Japan; we offer a straight six 3 series with 400 hp and 397 lb – ft of torque, interestingly with what we believe is the lowest C02 rating and best fuel economy rating of any vehicle available today with 400 hp – again back to “And Engineering,” how can you do both? In the 5 series range, we will be bringing the latest iteration of the BMW 5 series, the F10 with the exact Powertrain that you see here in the B7 Bi-Turbo to be named the B5 Bi-Turbo and that should be in customer hands by the end of this year, by the end of 2010. 2010 is the last year of the current B6S on our race Powertrain and V8 power plant that we found in last years B6 GT3 racecar that will be going out of production this year. It’s currently going out of production about now and will be followed at some time in the future by the B6 Bi Turbo based on the B7 Bi Turbo that we see and the B5 Bi Turbo. One interesting and important note, in the United States the vehicle is named the BMW Alpina B7, around the world it’s named the BMW Alpina B7 Bi Turbo by virtue of the fact that naming and nomenclature in North America is unique. With BMW using the Twin Turbo and Twin Scroll naming, Twin and Bi Turbo was felt to be a conflict. And they’re right – people would have a hard time getting their arms around it so we just dropped ‘Bi Turbo’ for North America. So we have, in summary, the 3, 5 6, and 7 series? Those four platforms are pretty much a given for us depending on the engine iteration, often we like to have two engine iterations in the 3 series and the 5 series. Currently with 3 different families of engines, having a fourth family would be difficult but it’s certainly something that we’re looking at and we’ve done a lot of early phase engineering on. Now we’ll look at Diesel engines. We know you have an Alpina tuned Diesel engine. Could you tell us a little bit about Alpina and Diesel engines? In the early 90’s the genesis of it was that BMW fairly were behind, VW were doing some brilliant things relatively back then, and Audi, through VW. The BMW diesels both 4 and 6 cylinders were not terrific. We developed with Steyr together the D10, which was a 3.0 Liter straight 6 diesel outputting 245 hp, 500 Nm (369 lb-ft of torque), then – that achieved 20% better fuel economy than the 138 hp 523tds that BMW had in their lineup. We sold that engineering to BMW and that was really the Genesis of our engineering contracts for BMW that are institutionalized with our engineering center. Those 5 bespoke testing stands: the climate chamber and the rear wheel drive, front wheel drive, all wheel drive rolling road that we’ve got. We’re institutionalizing things that we didn’t do by accident. So that D10 Bi Turbo was our first foray into Diesel, extremely successful in terms of its engineering prowess and that is actually the genesis or the basis for every BMW 330, 530, 730 Diesel to this day. The basic geometries came from that development, of course, BMW has taken the ball and completely run with it and done some brilliant things with which we are not involved – let’s absolutely be clear on that – but the genesis of their good straight 6 and straight 4 diesel engines was that D10 project with Alpina, Shtire and BMW together before Shtire became a wholly owned BMW subsidiary. The car that’s currently available is the D3 Bi Turbo 2.0 Liter 4 cylinder. It’s on the heels of a single turbo 200 hp 4 cylinder 2.0 liter. Now we’re up to 214 hp and more importantly 450Nm/332lbs-ft of torque, and combined fuel economy of 5.4 liters/100 km, so we’re talking about an amazing package. “Sat One,” a big, private German television station – we didn’t know they were doing this – they borrowed a D3 Bi Turbo from us and drove it head to head, nose to tail trading back and forth drivers and lead from downtown Frankfurt in heavy traffic to Paris in heavy traffic, sometimes on the Autobahn, sometimes on country roads, sometimes on heavy stop and go roads through the cities, and we achieved 12.5 % better fuel economy than a Toyota Prius Hybrid. That I think is a really strong message, hybrids are fantastic, very much have their place – they are the future long term. Diesel is to this day – and this is felt by many in the automotive industry – the best transitional solution. 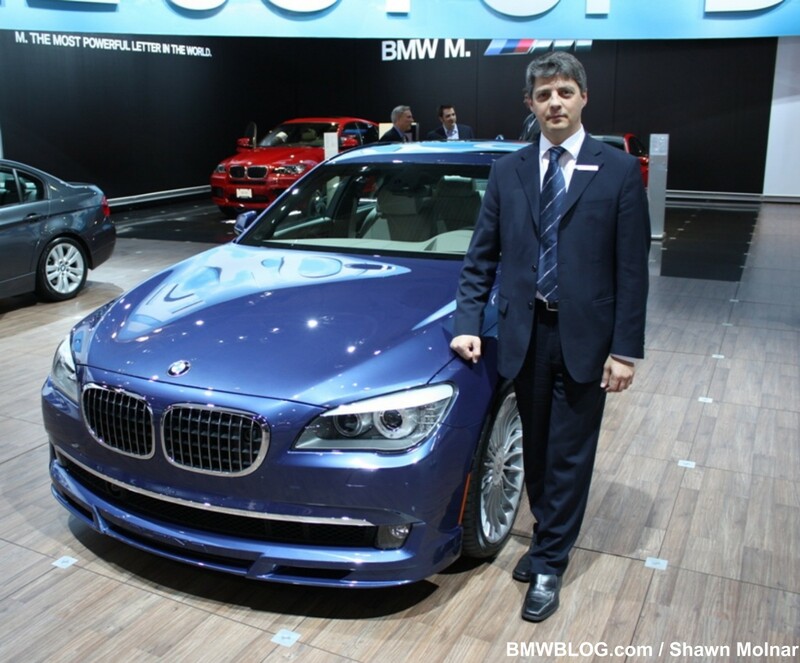 When will Canada and the US market receive your 3 series Diesel? Sadly, probably when hell freezes over, and I think you can probably quote me on that. The reason is not that it wouldn’t be a terrific idea, the reason is not that BMW wouldn’t want it or the politics involved – the B7 is the best example. With terrific help from BMW’s Dingolfing plant which is set up to build complex cars anyway, they can manage 4 cars a day for us. And it’s due to the depth and complexity of engineering in that vehicle? Yes, with the wiring loom or the wiring harness being the most complex piece of the vehicle, there wouldn’t be a situation where we could possibly supply the market with anything near the demand. And by virtue of that it’s fair to not even try to start – if we’re going to be a tenth if not a twentieth of what the market demand would be. You’ll leave us drooling then? Yes… or, if you just happen to move to Europe we can help! What is Alpina’s mantra, their motto, their mission? I think we’ve talked about it a bit. We talk not about highest performance; we talk about highest ease of use. We talk about “And Engineering:” how we can do two things, how you can be reliable and quick. “And Engineering,” highest ease of use and high performance, we talk about low revving but very high in torque – which as you were saying lends itself to Diesel engines and why the Diesel question – but also to very good petrol engines with charging whether super or turbo charging. We talk a lot about being sport luxury rather than luxury sport, with the emphasis on luxury and the ability to wear that tuxedo each and every day – but when needed, be assertive. It’s a bit of a James Bond feel to it, so that’s very much a good analogy for describing a BMW Alpina vehicle. Well I think we’re very much at a crossroads – that is a very good point. With the business model we talked about: European based, Japan based in limited markets 500 cars a year through the 80’s and 90’s transitioning to our North American launch and a business model of working through BMW of North America and not directly with an importer, and rising sales to a level where AMG were, interestingly, before they were sold to Mercedes – to the next step being that added business model of engineering prowess and leveraging it for BMW projects and expanding the current relationship as we have it in selling in larger markets. I think we’re at a real crossroads, I think it will be interesting to see what we do from a volume standpoint and to see into which markets we go and how we grow in the coming years. The growth from say late 90’s to 2007 and in just 10 years to triple our size is just massive already. We’re stabilizing at that new higher level now and I think you’ll most likely see us grow in both markets and volume. Maybe not triple again – but to a marked degree. So very briefly, your workforce totals 220 staff? It’s 200+ folks that we’ve got here now, up from the 145 when I started in 2002…a positive story in these tough times – predominately engineering and production staff. Sales and marketing is a non-entity for us – again, word of mouth and repeat sales. We continue to see that number rise and the engineering depth of projects that we do for BMW grows. To a degree – they’re brought back to Alpina. Interestingly, the same is true of M, by virtue of the fact that M and Alpina are manufacturers of record we have to complete the cars and sign off on legal liability for operation on public thoroughfares, but there is quite a bit of engineering in the car and production in the car and that work can’t be done on a major production factory line because we would slow it down too much, so that work we do finish at our house. Why does Alpina choose to work with BMW as opposed to another brand? Intrinsically if the vehicle has 4 doors, and many would argue if the vehicle has only two doors, BMW is the finest motorcar in the world from which to work as a base. I think it goes all the way to BMW’s engineering prowess in terms of aircraft engines, straight sixes, it goes back to the 50:50 weight balance, being the leaders in active safety rather than just – and I don’t mean that badly – not just passive safety but active safety. Mr. Bovensiepen felt this way in 1961 and 49 years later I think he’s still right – that BMW was yielding the best basis from which to work. You have to think, that was at a time when really you had two luxury automakers in the world, you had Mercedes and you had Cadillac. Those two sold half a million cars a year and everybody else was a rounding error. So for him to risk BMW, with his sense for technical expertise, says as much about BMW as it does about his engineering prowess and understanding. Describe the ideal Alpina driver. I think you can’t describe that person in age or status. I think you’re talking about someone who’s interested in a bit of the road less traveled. Exclusivity is certainly a draw but the fact that they’re as proud of having driven on the autobahn at top speed as they are of being on a longer journey of 4, 5, 600 miles to the Pocono’s or to the North of England or across France and achieved astronomical mileage, mileage that they never expected to get in terms of fuel economy – they’re as proud of that as they are of the capability of the vehicle in naught to sixty, or in top speed. It is an amalgam of feeling a bit like the car itself. I’m wearing my tuxedo, I’m wearing my finest dress and yet I can put the hammer down. I’ve always got it; I can always call it up. You might find them on the racetrack in their tuxedo then? One last thought that Mr. Bovensiepen might have is: the key to the vehicle is 80% to 90% of the time you’re not actively involved in the driving experience. The car should not reinforce itself negatively, it should be smooth, it should be graceful; it should be as easy to use as any BMW is. The 10% or 20% of the time when I’m actively involved in the driving experience – I’m not with clients in the car, I’m not on the phone, I’m not bringing my kids to school – I’m really actively involved in the driving experience, on the Autobahn, on a narrow two lane road – it’s the weekend – that’s when the car should reinforce itself positively and show its engineering prowess. The rest of the time I should be getting great fuel economy, I should have a very reasonable repair experience, I should have great reliability on the vehicle, a smooth ride – those are the hallmarks of Alpina: how do you do both. So this typical Alpina driver would be someone who’s passionate in life, active, someone of all age groups, but a person who searches for that extra? I think active is a good describer of who he or she might be. In addition to it, and this is a real key – it says something about our wine business as well – how can we provide an experience, whether it’s that excellent wine or that wonderful piece of jazz or classical music or rock and roll, or that driving experience that pulls you out of the every day. The experience itself is of such quality that enjoying it and reveling in it right now – that’s Mr. Bovensiepen, that’s his car, that’s his heart. BMW chooses “Joy” to describe their brand experience. In one word, how would you describe Alpina? I think connoisseur is the best term. A good example of that would be: people graduate in life. They graduate in their experiences, initially they might want more of something, then they want higher quality and then they want something bespoke, unique, exclusive, different. You grow though those levels and Alpina find themselves with their BMW Alpina automobiles in that third category. Connoisseur I think would be the right term, yes. What do you have in your garage at home? I’ve got a B3 coupe Bi Turbo and also a D3 Bi Turbo manual. Describe your responsibilities within the company. There are two sales directors and we split the markets across the world equally. We have a relatively thin staff that supports us, but we do the best we can. Let’s talk tech for a little bit. The new B7 has impressive performance numbers in terms of performance and economy. How did Alpina achieve this technically? Through a host of small, difficult developments with BMW together, again in a small volume setting. Things like – and again this goes back to the early 70’s – if you have a 20 spoke wheel that is indeed so light, the fronts are 9.9 kilos I believe and the rears are 10.1 Kilos. A 21” wheel, 10 inches wide and a little over 10 kilos is insane – with a very light conventional tire – that wheel and tire set up, that un sprung weight is so low, getting that mass to rotate in the first place takes work, work uses fuel. That’s just one example. We focus heavily on added lightness, we focus heavily on engine development and a lot of the reason we have the economy that we have is something called ‘the rule of the large engine.’ An engine driven in everyday use – when it is moving not when it’s sitting and what your losing what your paying for is just frictional loss – but when it’s moving often a larger displacement engine or a more powerful engine in the same displacement gets better fuel economy because it’s just less stressed. In the load spectrum from 0 to 100% full throttle, we’re just lower down the spectrum. In terms of your turbo technology, could you describe that a bit, are they variable vane, are they twin scroll? They’re based on the turbo technology that BMW use in the N62 B44 as well, although the turbos themselves, the vanes, the geometries are all unique and bespoke, dedicated to this application and developed from a race setup with Honeywell Garret. As a reminder to our readers, the B7 achieves what horsepower output, torque output and fuel economy? 500 hp, more importantly I would say, 516 lb –ft of torque and that across a broad rev range from 3000 to 4750 rpm. That provides naught to sixty in 4.5 seconds with a short wheelbase rear wheel drive, at the same time achieving EPA fuel economy figures of 15 city, 21 highway, 17 combined. In our experience driving on US roads you generally achieve better than that in the real world so that is great-going to achieve that combination. Alpina has many patents and many firsts in the industry in terms of ingenuity and invention – cross-drilled rotors, pre-heated catalytic converters, and precious metals in the converters. When we speak about precious metals are you referring to platinum specifically? Platinum is one of many precious metals that are used in a combination, in an alloy – not one single precious metal can be used. It’s also the technology of using the finest and hardest precious metals so that you can make the honeycomb, the cross section of the catalytic converter if you will, have more and more hexagons in it per square inch. That’s really the key and the best way you can do that and control that technology is with more precious and harder metals that are more expensive. So Alpina was the first to use precious metals of any kind in a catalytic converter? We were the first to have a metal catalytic converter moving from ceramic catalytic converters and we patented that design with our suppliers together, EMITEC. And that in our small volume setting was a great test bed for the first volume car in the world to have that, which was the BMW 750iL. It’s a real tribute to your ingenuity. And to BMW’s support in allowing us the opportunity and creating the situation for us to be able to pursue those patents. It sounds like you’re the right man for the job. Could you tell us a little bit about yourself, your background and what you enjoy on a daily basis? I started working in dealerships in the back in parts and service; I was the technician in motorcycle dealerships as well. I worked for BMW of North American and BMW AG for ten years, and I’ve been with ALPINA eight years now. So I’m well positioned to do what I do with a background at-uni of linguistics and physics. In terms of fun, if I get the chance: long runs, a lot of reading – which I certainly have a lot of time for on the airplanes, and just learning about new places, new cultures, new people – it’s the greatest part of my job covering 20 different countries across 13 time zones. You mentioned you have history racing motorcycles? I raced bikes for 17 years, predominately motocross and then graduated to road course racing and street courses. We would like to thank Mr. Odwarka for his generous time in completing this exclusive interview with BMWBLOG.